Unless you are travelling to a cultured city or town, where finding great coffee shops is all part of the fun, getting good coffee whilst travelling can be a challenge. Porlex Mini grinder – amazing little hand grinder, all stainless construction means it will withstand even the most aggressive baggage handler and grinds brilliantly. V60 01 – one cup version of the V60 in travel friendly plastic. 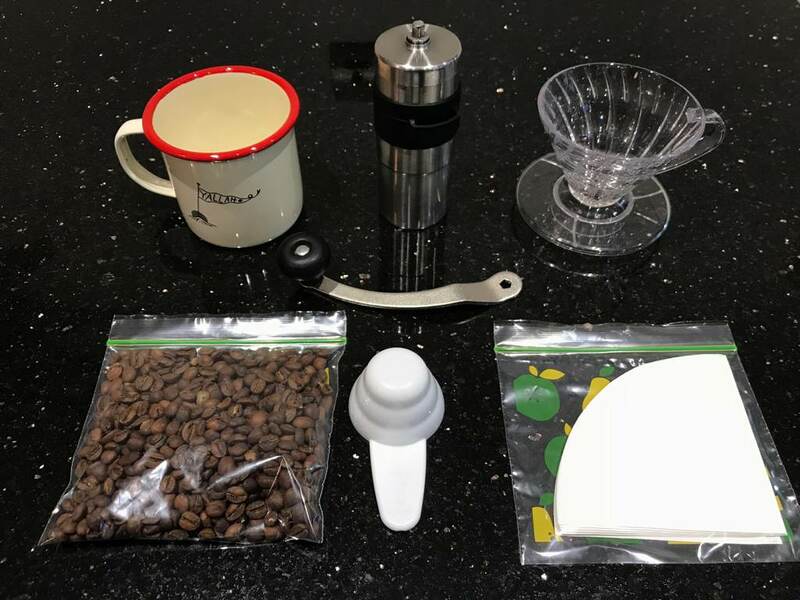 V60 Filters – handily these fit in the ziplock nags I use for coffee. V60 scoop – the coffee gods are on my side, as one scoop is the perfect amount for my travel mug. Yallah Coffee Camp Mug – there are many like this, but this one is mine, and it makes me think of Cornwall, and that makes me happy. Coffee – sealed in a ziploc bags to keep it fresh. Weighs very little and packs up into a small space – just add hot water.